Observation - Spotted Cranefly mating - UK and Ireland. Description: These crane fly where mating on the wing making a very strange looking insect until I realised it was two of them. They then landed on a laylandii tree. 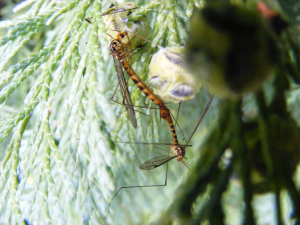 These crane fly where mating on the wing making a very strange looking insect until I realised it was two of them. They then landed on a laylandii tree.